Tired of players tracking your play and results at the online poker tables? If you are than Ladbrokes Poker has the answer for you with its anonymous poker tables. 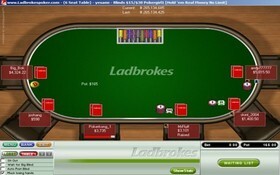 The special anonymous tables are currently available at Ladbrokes, and players have the capability to alternate between normal tables and the anonymous tables. Ladbrokes players choosing to participate at the anonymous tables will only be privy to their own Avatar; all they will see is their opponent’s cards –no screen-name, no picture, no nothing! Ladbrokes claims this will make the anonymous tables 100% immune to tracking software or data-mining sites. If the anonymous tables prove to be a hit at Ladbrokes you can definitely expect more and more poker sites to add their own version. This entry was posted on Sunday, October 24th, 2010 at 12:26 pm and is filed under Poker News. You can follow any responses to this entry through the RSS 2.0 feed. You can leave a response, or trackback from your own site.